N.B. Ingredients are given per person. Use any sort of salad leaves (Delia apparently likes rocket, I like spinach, but any sort of mixed leaf will also do. Avoid iceberg – it’s too bland and a bit seventies for my version) – enough to amply cover a dinner plate. Haricots verts/ green beans – cooked on a rolling boil for just 5 minutes so they retain their crunch and are still bright green. Dunk them in a bowl of cold water to keep their colour bright, then pop them in the oven with a couple of nobs of butter, a shake of salt and pepper and a sprinkling of parmesan cheese. Leave 10 minutes on 150C or until the butter and cheese have melted. Then cool and add the beans to the salad leaves. 1 boiled egg, just warm and halved or quartered. Don’t add hot eggs to the plate as they will wilt the leaves. A small handful of cherry tomatoes – either whole or halved, toss over the salad. 2-3 salad onions, chopped and dropped liberally across the salad. Once all the salad ingredients are on the plate, start with the tuna. It needs watching so as not to overcook and become dry. 1 tuna steak, marinated in teriyaki sauce. Cook just a few minutes on each side, so that the centre of the steak is still pink. Sprinkle with sesame seeds and place on top of the salad. Pour any remaining teriyaki sauce over the top as this will provide an automatic dressing. 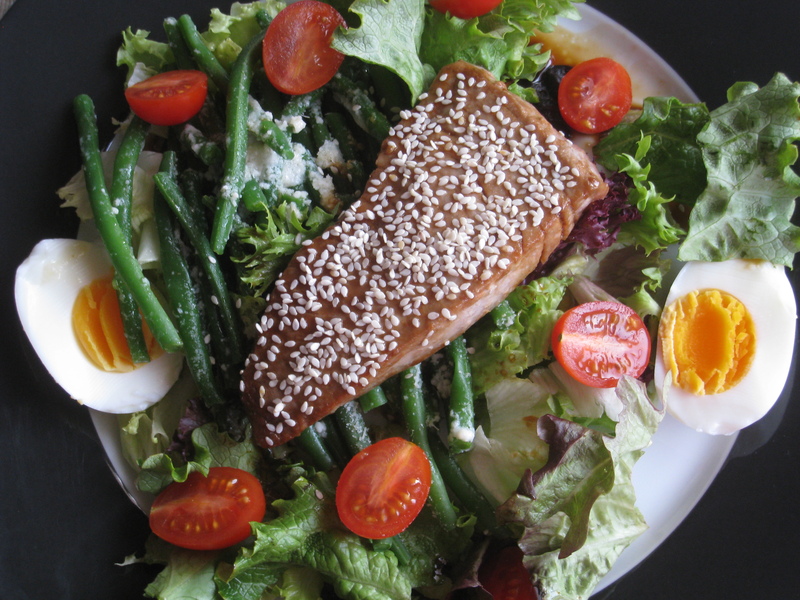 Some argue that a proper Niçoise salad should have either tuna or anchovies but not both. I’m easy on this score. The only thing I would suggest is that if you decide to add anchovies, make it the fresh, marinated anchovies as these are less salty than the preserved kind and bring a truly zesty tang to the salad. So, as you can see, this is far from a traditional Niçoise. I blame my Pacific-rim upbringing and a love of teriyaki sauce.